Silver-green plant, standard and most common Australian variety, also suited to warm climates. The most esteemed variety in Paris in 1859. Read more on growing Artichoke here. Gourmet vegetable, originating from Western Mediterranean in ancient times. Attractive grey-green foliage. Tall 1.5m perennial (5 years). Rapid growing, use in garden windbreak. 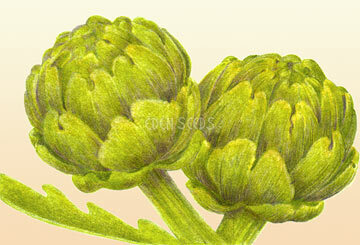 Cut buds when heads are tight and flat 5cm below bud, late first summer, boil until tender. Cut plant and mulch after harvest. Well drained, well limed soils. Plant after frost.